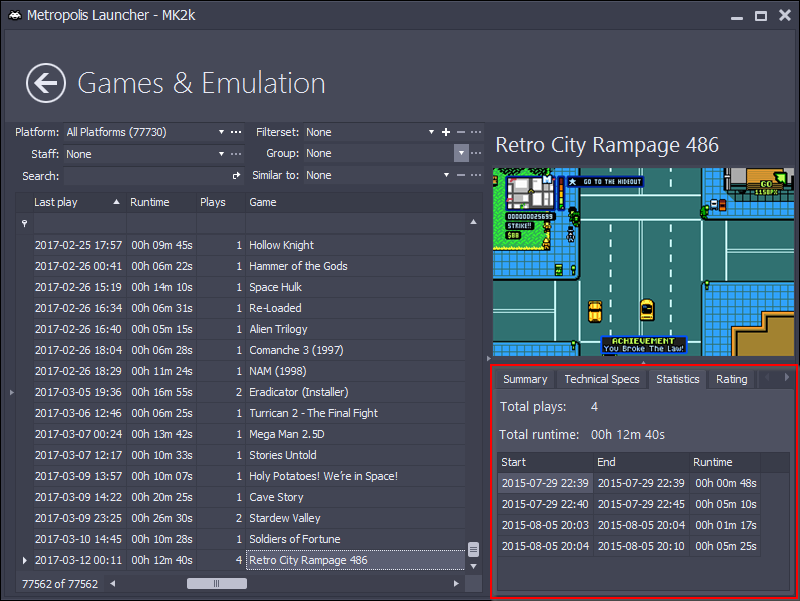 Metropolis Launcher has been created to be a great old-school launcher, emulation front-end and an extensive offline database of video game metadata thanks to MobyGames and their strong user base. Managing thousands of games and multiple emulators can be quite complex. However, intuitive context menus, a stream-lined ROM import process and a thorough emulator management allow to handle the complexity. Metropolis Launcher ships with a detailled on-line help which includes step-by-step instructions and background informations. Metropolis Launcher is optimized for full ROM set usability. Keeping track of 50,000+ games is well within the ballpark. Over 50 fields of meta data are supported by Metropolis Launcher's Main Screen. You can search-as-you-type, filter, group and sort by any combination of them. No web-scraping for meta data is needed. Use Cursor Left/Right or swipe left/right to browse through the screenshots. Click any field and start typing, Metropolis Launcher will find and highlight the next result. Browse through results by holding CTRL and using cursor up/down. Perform a table-wide search using CTRL+F, which acts as a filter (the number of rows will be reduced to the ones that contain the searched term in any column). 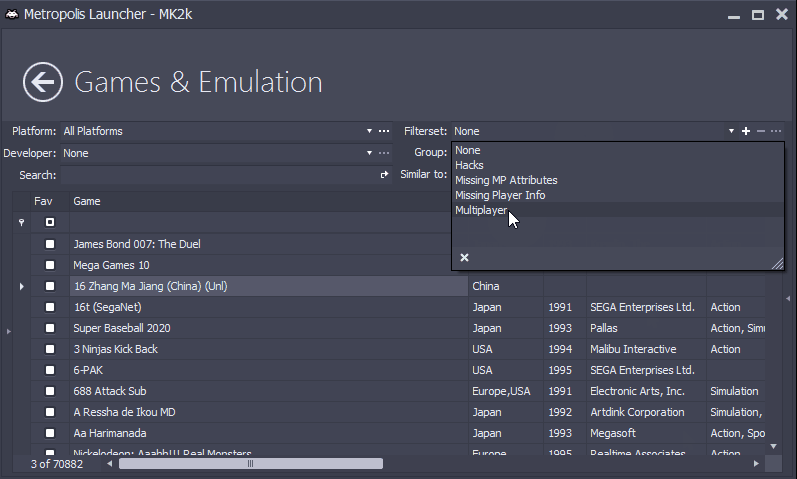 The Quick Filter is an easy access to filters for your games' data. Open the panel on the left, choose which data should be filtered and set the filter (multiple filter entries are possible). In this example, we'll filter Action games, which support 2 or more maximum number of players, Co-Op or Free-for-all Multiplayer Game Modes and the Same/Splitscreen Multiplayer Option. 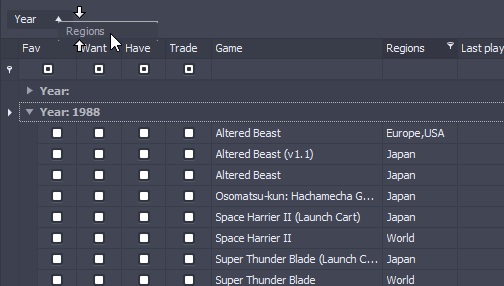 Important: There are more possibilities to filter data in Metropolis Launcher (see below), however for the Games List you should use the Quick Filter first. Filter any column using the Auto Filter row by typing a filter term. You can use "%" or "*" as the first character to apply the filter text to any occurrence within the data, else the data has to start with the filter term. The Filter Button in each column header provides a Filter Dropdown List which lists all distinct values of the column data. If you click a value, the column will be filtered by that value. Additionally you can filter by Blanks and Non-Blanks. The Filter Dropdown List is aware of the underlying datatype. In this example we can easily filter all favourite titles that have been played earlier this year. You can use the Custom Auto Filter to create more elaborate filters. 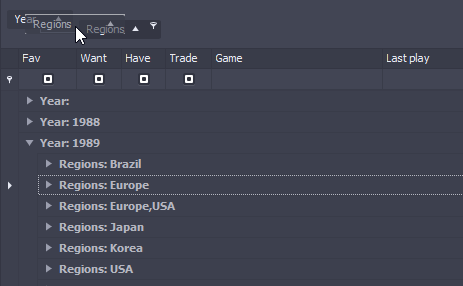 In this example we want to view only games released in the Europe or USA region. No matter which filter functionality you initially use (Quick Filter, Auto Filter Row, Filter List, Custom Auto Filter), it all ends in a filter tree editable in the Filter Editor. 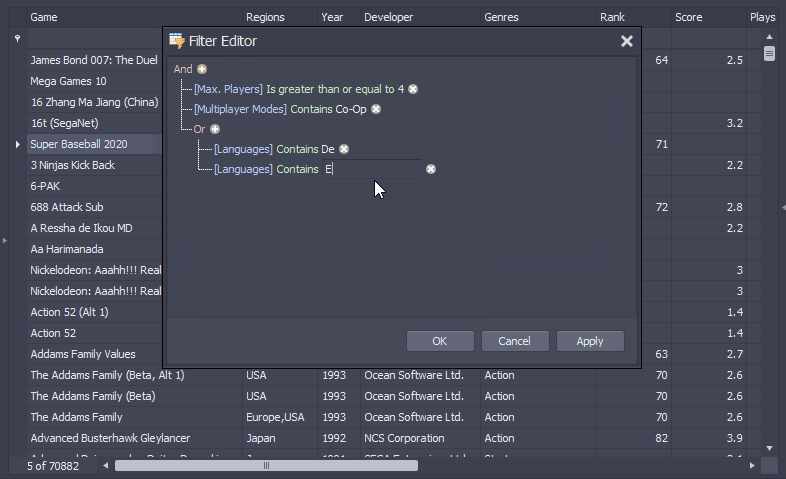 You can however start right with the Filter Editor and create very precise filters. In the following example, we'll create a filter for games that support 4 or more players, Co-Op multiplayer and German (De) or English Language (En). After applying the filter, we re-visit the filter settings once again and change the German (De) language filter to French (Fr). Creating filters can be a laborious task. 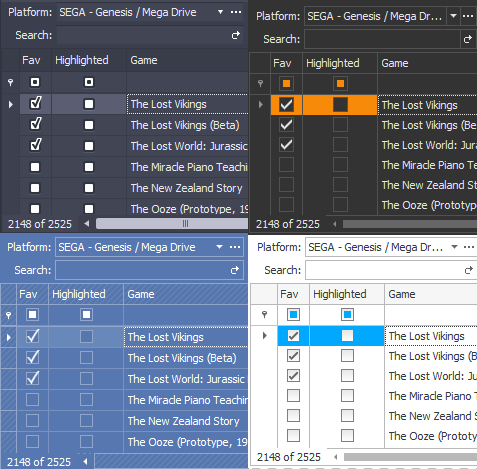 For the Games & Emulation main screen, you can save and load your filters with the Filtersets collection. In this example we have some already set-up Filtersets which get loaded by selection from the Filterset dropdown. Additionally, we'll create a new Filterset utilizing the Auto Filter Row with games that are checked as favourite and are released in 199*. We'll save this Filterset as "My Favs from the 90ies". Metropolis Launcher provides 18 skins to choose from. Metropolis Launcher is full of tabular representation of data. The biggest table within Metropolis Launcher is without any doubt the Games & Emulation Main Screen with all the games and their respective name, genres, developer, year etc. metadata as columns. There are however numerous minor tables in dialogs. All tables share common functionality. 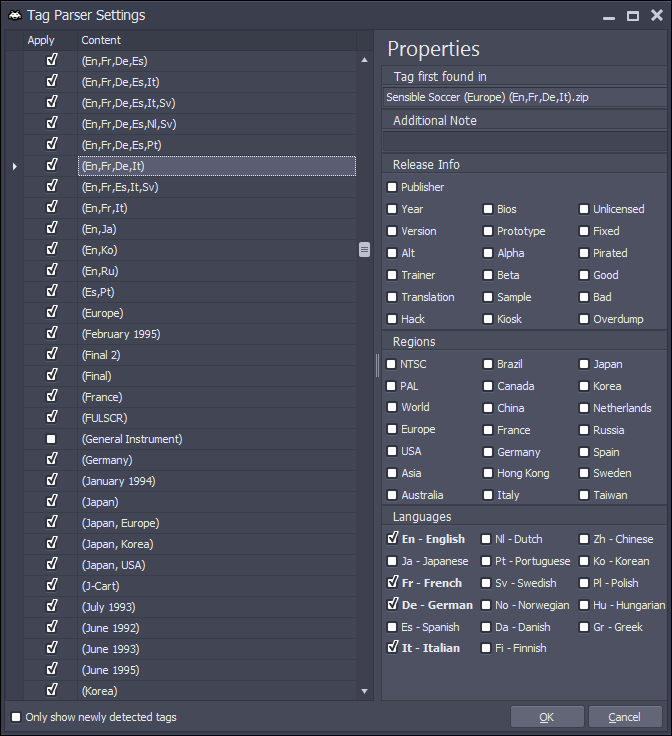 Anything you set up within tables (visibility, sequence and size of columns, sorting, sort order, filtering and grouping) and layout will be saved when you close a dialog or exit Metropolis Launcher. When you re-open the table these settings will be restored. If you want to hide a column, just drag its header off the table header. If you want to add a hidden column to the table, open the Column Chooser from the table header's context menu (right click) and drag its header on the table header. You can resize columns by dragging the right edge. If you want the column to auto-fit by it's contents, double click the outer right edge. Rearrange columns by performing a drag & drop of the column header within the table header. Sort the table by one column exclusively by clicking its header once. Invert the sort order by clicking it a second time. Sort the table by multiple columns by holding SHIFT and clicking the headers of the sorting columns. Click the headers once again (still holding SHIFT) in order to invert the sort order. In order to clear the sorting of one column, hold CTRL and left click its header. You can also clear the sorting of one column by opening up the column header's context menu (right click) and choose Clear Sorting. If you want to clear all sorting, open the context menu of a column header and choose Clear All Sorting. You can group by any column by opening the Group By Box via the column header's context menu (right click) and performing a drag & drop of the grouping column. You can group by any column by choosing Group By This Column from the column header's context menu (right click). You can re-arrange the grouping hierarchy by opening the Group By Box via the column header's context menu (right click) and performing drag & drop of the column headers in the Group By Box. 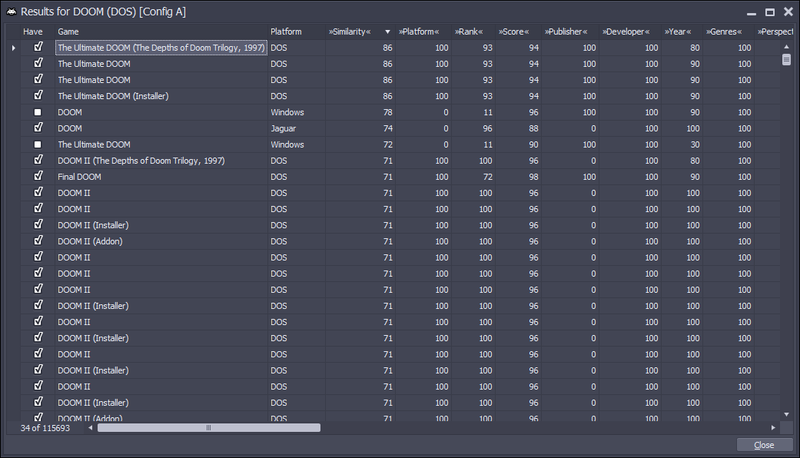 You can edit any meta data of your games - even those coming from MobyGames. However, there is also some user based data which you can use in Metropolis Launcher. You can set up a minimum amount of time. If you, for example, set it to 5 minutes, any gameplay under 5 minutes will not be counted towards the statistic, so you can prevent quick playtesting to be considered. In Metropolis Launcher you can favour games easily by ticking the checkbox in the Fav column of the table. You can rate your games by assigning stars to the categories Gameplay, Graphics, Sound, Story and Personal (slant) in the Rating tab. You can weight each category globally. Based on the stars and weights a rating score is calculated between 0 and 100 (more = better). This rating score will be displayed in the Rating column of the game. by ticking the checkboxes in the Have, Want and Trade columns. You can use the Multi User mode for parental control (define which games are accessible to a restricted user). After activation you'll be prompted with a login screen after starting Metropolis Launcher. The login screen provides a dropdown for the user names and a password input if the user is password protected. Metropolis Launcher supports all emulators which themselves support command line / startup parameters to run a certain rom file. If for example an emulator emu.exe lets you run a romfile rom.bin with a command like emu.exe path\to\rom.bin, the emulator can be used within Metropolis Launcher. 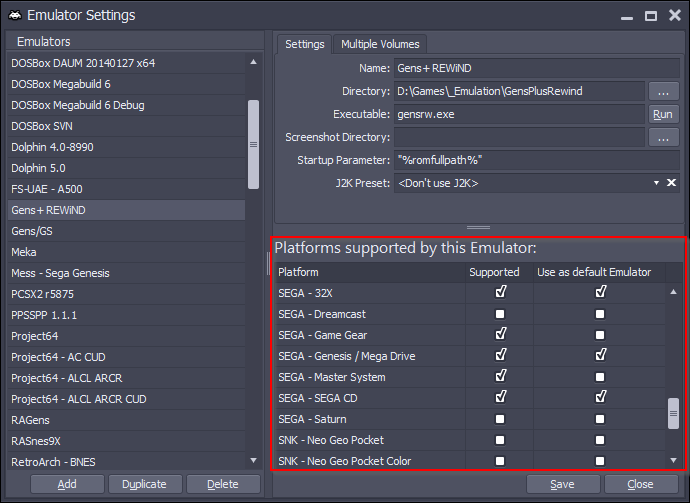 For each emulator added to Metropolis Launcher, you can define which platforms this emulator supports and for which platforms it should be the default emulator (i.e. it should be used when the game is doubleclicked or launched via pressing Enter, it is also used when a random game is launched). 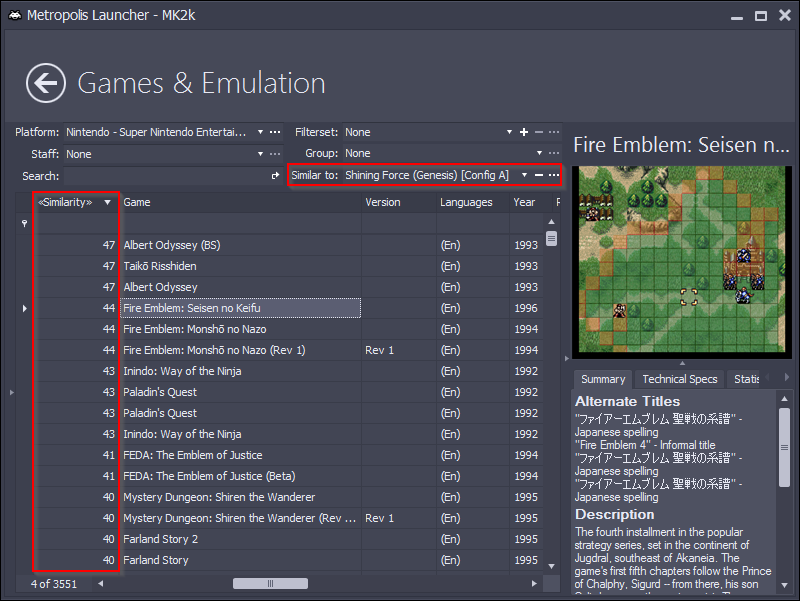 You still are able to define a default emulator for certain games as well as choose the emulator upon launch. The M.A.M.E. 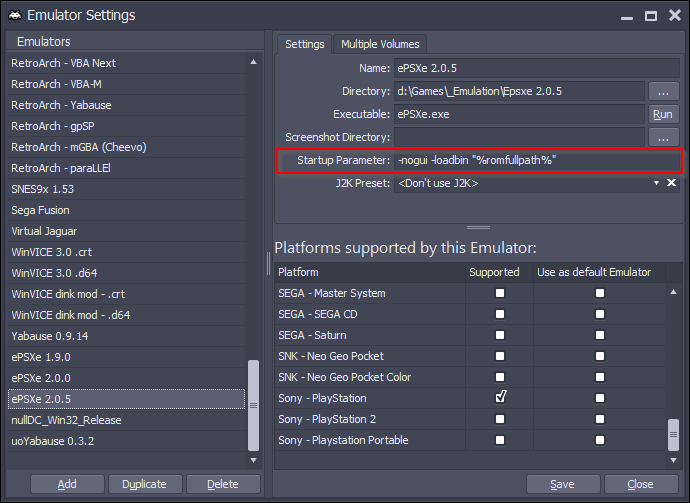 Arcade emulator is supported by Metropolis Launcher. As it brings its own internal ROM database, a special M.A.M.E. Configuration dialog takes care of the import process. The M.A.M.E. universe brought up projects providing meta data for Frontends, namely mameinfo.dat, history.dat, nplayers.ini and catlist.ini. All of them are supported by Metropolis Launcher and can be imported. 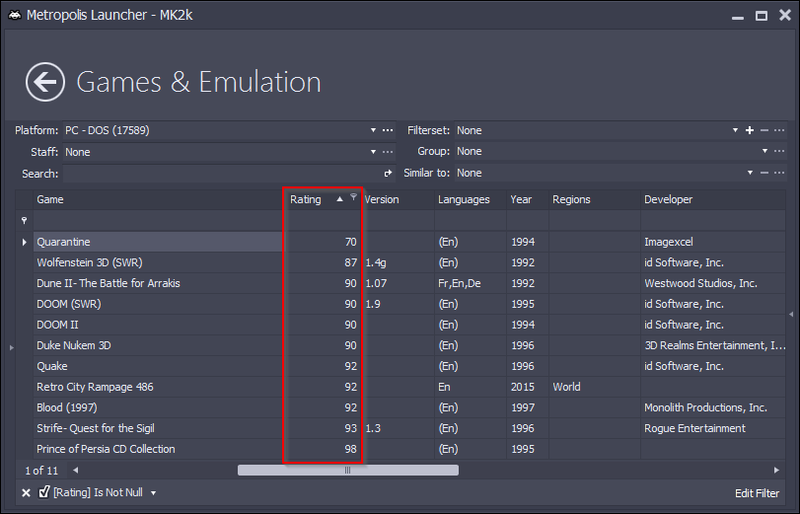 The DOSBox emulator needs more than just a startup parameter in order to run games. There needs to be a (base-) configuration, an autoexec script handling mounting and some commands to actually start the executable. Therefore, Metropolis Launcher implements a template based configuration into the user interface. You can define multiple templates as base configuration for your games. 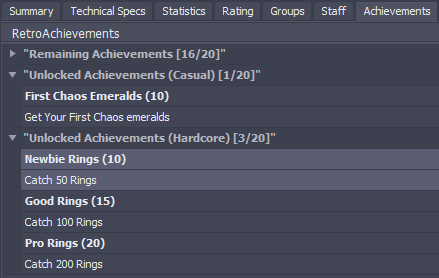 If certain games need specialized configurations, you can set these up based on a template, too. 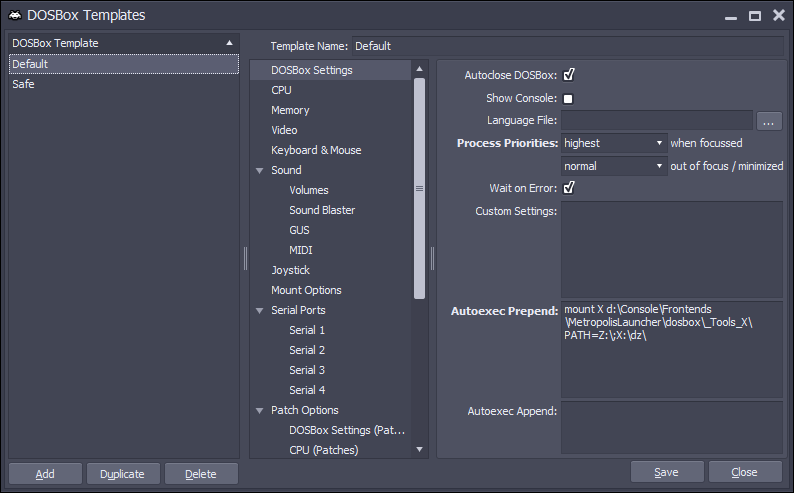 Metropolis Launcher supports unofficial DOSBox releases with enhancement patches, such as 7z/zip mount, Voodoo & GLide support, Roland MT-32 MIDI device etc. 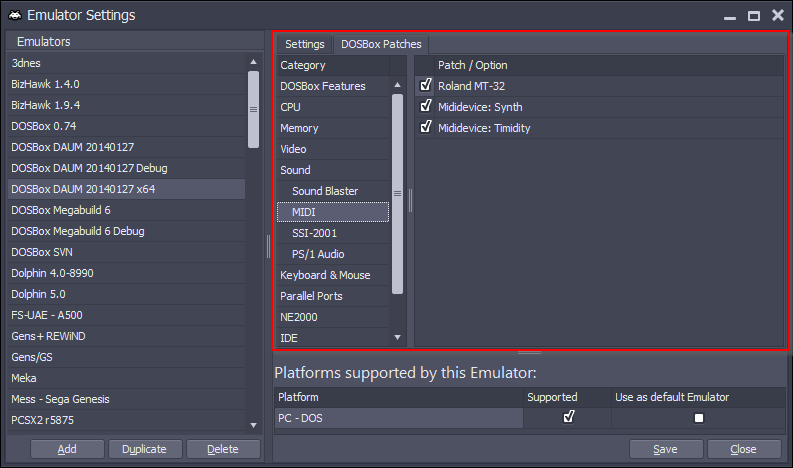 In order to utilize them, you can define which patches are provided by the DOSBox release in the Emulator Settings dialog. If you use the rather popular DAUM Café DOSBox release, Metropolis Launcher will already be aware of the applied patches. Metropolis Launcher supports multiple possibilities on how you store your game data. Plain ROM files can be organized in (sub-) directories and are not packed (as zip/7z/rar). Import: You can import plain ROM files in Metropolis Launcher by providing the directory (the scan will include sub-directories) or a selection of one or more files. File Extensions: As the file extensions for ROM files are quite arbitrary, there is no restriction on them. Metropolis Launcher will import every file it finds within the directory/file selection. Launch: Metropolis Launcher uses the file's location to launch the game. Packed ROM files can be organized in (sub-) directories. They could be one ROM per zip/7z/rar file or multiple. Metropolis Launcher even supports full ROM sets within a single zip/7z/rar. Import: You can import packed ROM files in Metropolis Launcher by providing the directory (the scan will include sub-directories) or a selection of one or more packed files. During import, Metropolis Launcher scans the content of packed files and imports each inner file (file within the packed file). File Extensions: Metropolis Launcher supports .zip, .7z and .rar archives. Launch: Metropolis Launcher unpacks the file/s associated to the game in a temporary directory and launches the emulator with the unpacked content. The temporary directory will be cleaned up by Metropolis Launcher. Metropolis Launcher supports platforms where games can consist of multiple files, for example Sony - Playstation having multiple CD images per game or Commodore - C64 having multiple Diskette images per game. During the import process, Metropolis Launcher analyzes filename tags, like (Disk 1 of 2), (Side A), (Disk 2 of 3 Side B), (CD2) etc. in order to group multiple images to one game and assign volume numbers. Metropolis Launcher supports the PC - Windows platform. You can import executables (.lnk, .exe, .cmd, .bat). 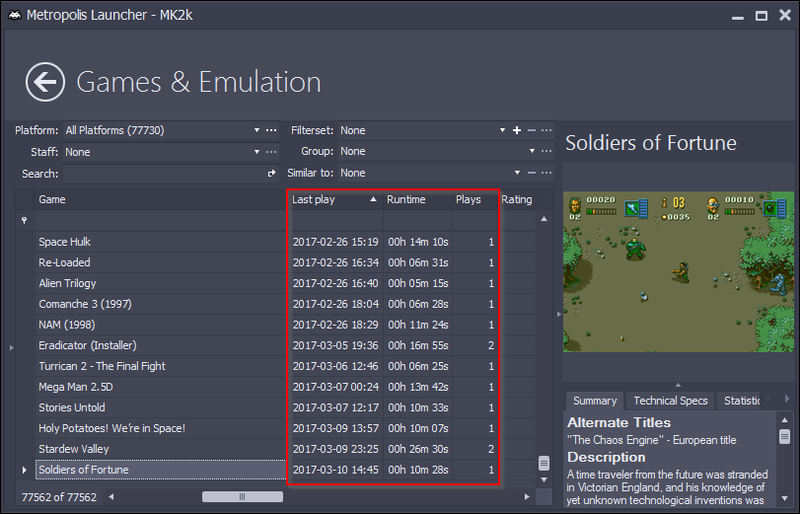 It is recommended that you create a directory with links (.lnk files) to your Windows games first and import these. 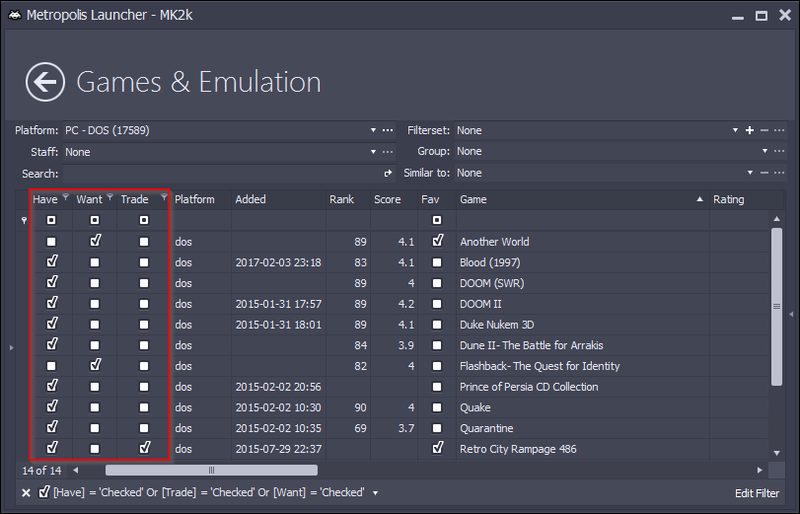 As Windows games often provide executables with names like game.exe, run.exe, launcher.exe etc. it would be hard to differentiate these games after import. For an installed game within a directory, you can add this directory to Metropolis Launcher. Upon launch, the directory will be mounted as drive C.
For an installed game within a packed file (.zip, .7z), you can add this packed file (or a directory containing multiple games within packed files) to Metropolis Launcher. For each game a working directory will automatically be created. Upon launch, if you use a DOSBox release with 7z/zip mount patch, the packed file and the working directory will both be mounted as drive C.
Upon launch, if you use a DOSBox release without 7z/zip mount patch, the packed file will be extracted (if it hasn't already been extracted) to the working directory and the working directory will be mounted as drive C.
If you just added install media of a game (e.g. CD images) a working directory will automatically be created. Upon launch, the install media will be mounted as drive D, the working directory will be mounted as drive C. You can then perform an installation within the DOSBox session. 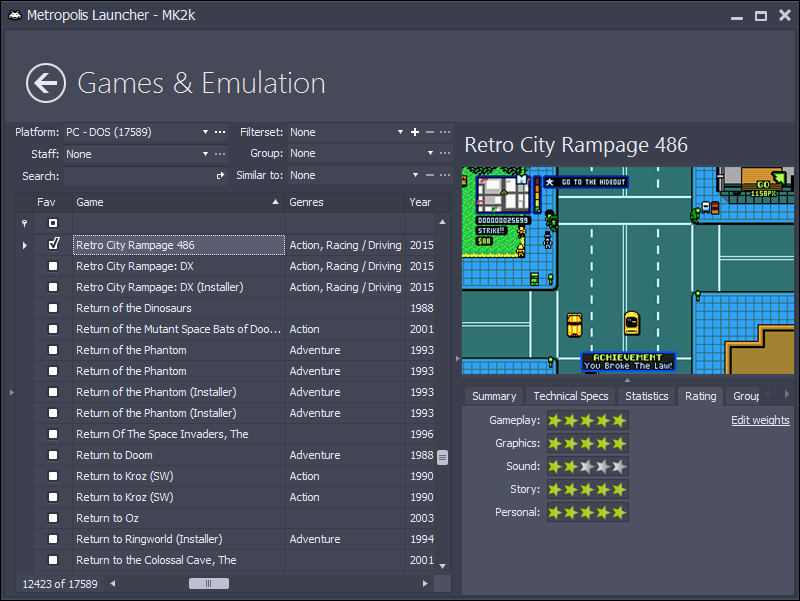 Metropolis Launcher scans the contents of packed games and games within directories for executables. Upon launch you get the list of found files for selecting a MAIN executable, SETUP executable or INSTALLER executable. When you add or rescan one or more games, Metropolis Launcher scans the filename/s for tags. Tags are usually enclosed in (round brackets) or [square brackets]. Furthermore there is version information, e.g. v1.337. After all tags are found, a Tag Parser Settings dialog opens up, where you can map a tag (left list) to it's meta data (right list). Metropolis Launcher is already aware of 33.000+ different tags, where the corresponding meta data is already chosen. You can use the Tag Parser Settings dialog to alter these settings, though. 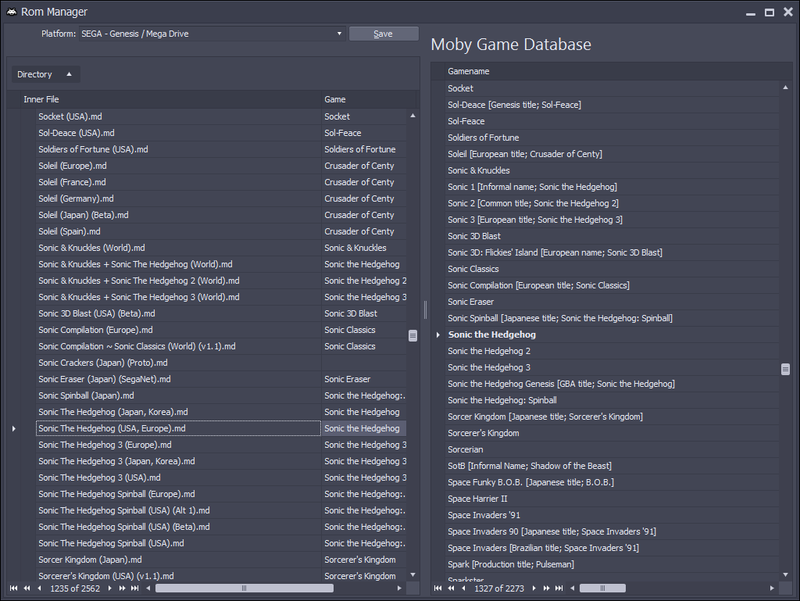 Metropolis Launcher ships with a database containing meta data of MobyGames. In order to link this meta data to a game, Metropolis Launcher ships a second database, called the ROMBase. The ROMBase contains 78,000+ records. In order to automatically link a newly added game to its meta data, Metropolis Launcher works either with checksums or identifiers. Checksum based identification is used on all cartridge and diskette image based platforms, i.e. the games are ROM/diskette image files. For every game a checksum is calculated and looked up in the ROMBase. If a record is found containing a link to MobyGames meta data, that link is applied to the newly added game. Identifier based identification is used on all CD image based platforms, i.e. the games are CD image files (.iso, .cue/.bin, .wbfs etc.). This method only works, if the games have a unique identifier, either at a certain position within the CD image binary (Nintendo GameCube/Wii) or in a file within the CD image (Sony PS1/PS2/PSP). The identifier gets extracted from the CD image and looked up in the ROMBase. If a record is found containing a link to MobyGames meta data, that link is applied to the newly added game. The maintenance of the ROMBase is an ongoing project by itself. See the Metropolis Launcher Documentation for the platform based status. If Metropolis Launcher didn't automatically link MobyGames meta data to your added game, you can still manually perfom the link. It requires a doubleclick within the Rom Manager. 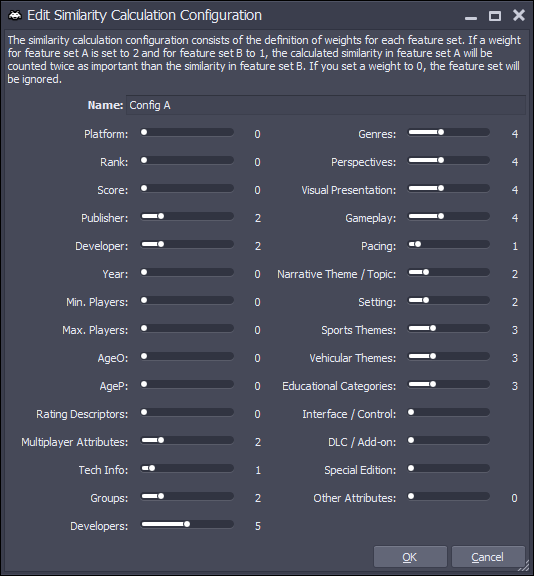 Similarity Calculation is an experimental feature of Metropolis Launcher that calculates similarity scores of 0 to 100 for each game B based on a selected game A. A score of 100 means maximum similarity, a score of 0 would be maximum dissimilarity. The fundamental data for this calculation are feature sets of the meta data. Feature sets are: platform, publisher (company), developer (company), staff members, genres, perspectives, year of release, game groups etc. Of course, some feature sets could be completely left out of the calculation (e.g. you don't want to take the platform into account or the year of release). Also, there might be feature sets, that are more important than others. Metropolis Launcher allows you to weight each feature set and save them as a Similarity Calculation Configuration. https://retroachievements.org is a set of modified emulators (including RetroArch) and an online database allowing you to unlock and track achievements in emulated games. Metropolis Launcher helps you keeping track of (un)locked achievements for the supported games with its RetroAchievements feature. Challenges can contain RetroAchievements and additionally runtime-based achievements. You can use runtime-based achievements for games which are not supported by RetroAchievements. With Metropolis Launcher you can easily export the current list content as CSV and XLSX. Any applied filter as well as column sequence applies to it - you export what you see. Metropolis Launcher also implements an actual game export. 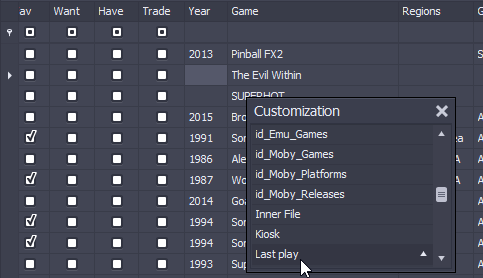 Select one or more games from your list and export them into a destination directory of your choice. You can also decide if you want the games to be packed as .zip files. If you work with .zip packed DOS games, you can export a selection of them as a Total DOS Launcher Collection. 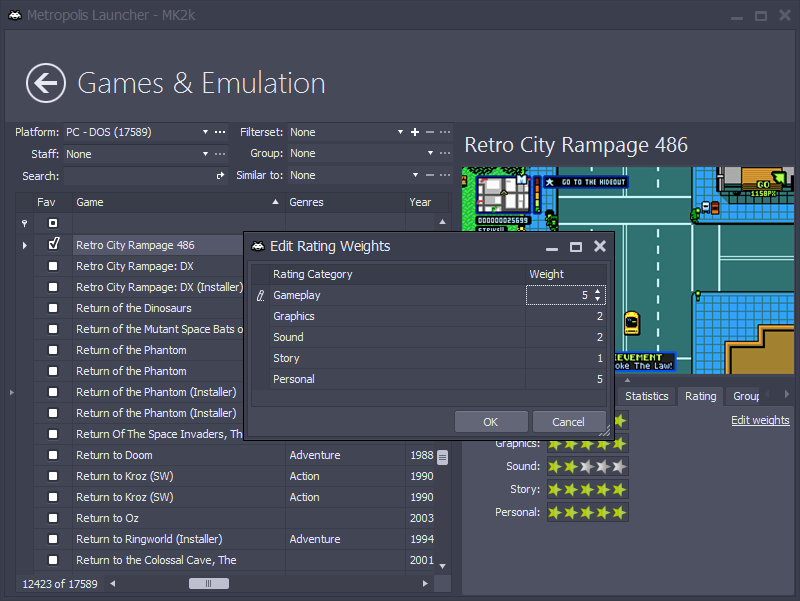 This exports the games and creates a DOS-native launcher bundle. 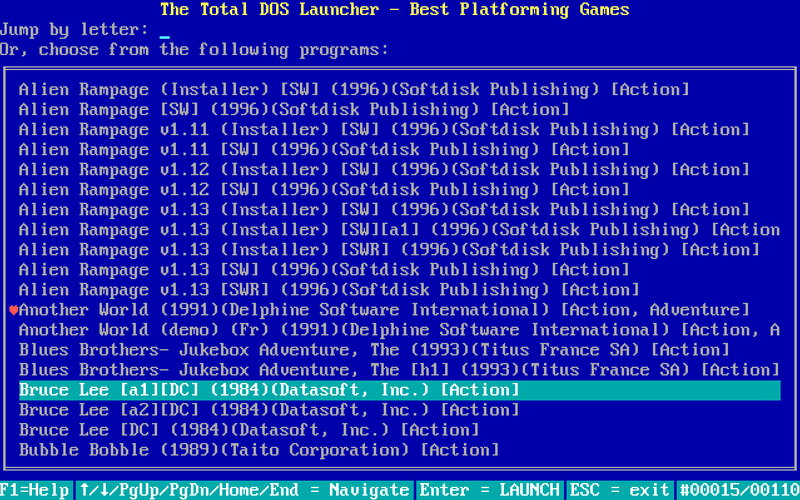 Total DOS Launcher is a system for easily loading and running thousands of DOS programs on vintage hardware created by Trixter. Metropolis Launcher ships Total DOS Launcher in its current version inside the tools subdirectory.